I’m not a fan of Anzac Day, in fact, its my least favorite national holiday. A memorial day for those who served and died in war shouldn’t be a cheery affair but that’s not the reason I don’t like it. When I was a kid in the seventies Anzac day was a mournful affair, many of the original diggers from the first world war were still alive. I would watch the parade from my house as these old soldiers walked or rode in vintage cars down the road to the war memorial. The sight of these old men in their uniforms, wasn’t so much heroic as spooky and sad, they seemed to personify the horror of war. Every small town in Australia had a war memorial and the casualty lists from the first world war were sobering. At a time when Australia had a population of less than 5 million – 416, 809 men enlisted, over sixty thousand died and at least 156, 000 were wounded, gassed or taken prisoner. It’s an extraordinary toll for a country thousands of miles away from the battlefields. I have family photographs of the scenic sights of Egypt that my great uncles sent to my grandmother during the war. My great uncles must have thought how mad it all was. What the hell they were doing, fighting a war in this strange and exotic place, on the other side of the world. In the late nineties, under the conservative government of John Howard, Anzac Day became re-invigorated as a national day of mourning. In recent years, it’s become even more revved up, a day of feverish displays of patriotism from politicians and would be warriors. There are commercial tours of European battlefields and thousands of Australians trek over to Turkey to attend the dawn service at Gallipoli. Patriotic bogans wrap themselves in the flag and get sentimentally teary eyed about the sacrifice of the, now mythical, diggers. It’s all a bit tacky and commercialised and bears little resemblance to the somber, depressing day of my childhood. But despite my reservations about our national day of remembrance I still make a double batch of Anzac bikkies on Anzac Day. The original Anzac biscuit was a hard tack biscuit sent to troops during the war and it was a fairly dour and plain biscuit more like an oat cake than the sweet biscuits that are made today. I’ve been making Anzac biscuits with reasonable frequency for about 13 years since my son was born. (They’re a great family biscuit) I’ve used a number of different recipes over the years and never settled on the one tried and true favourite. Indeed, most Anzac Days I do a quick google search for something like ‘best Anzac biscuits’ and try a new recipe. 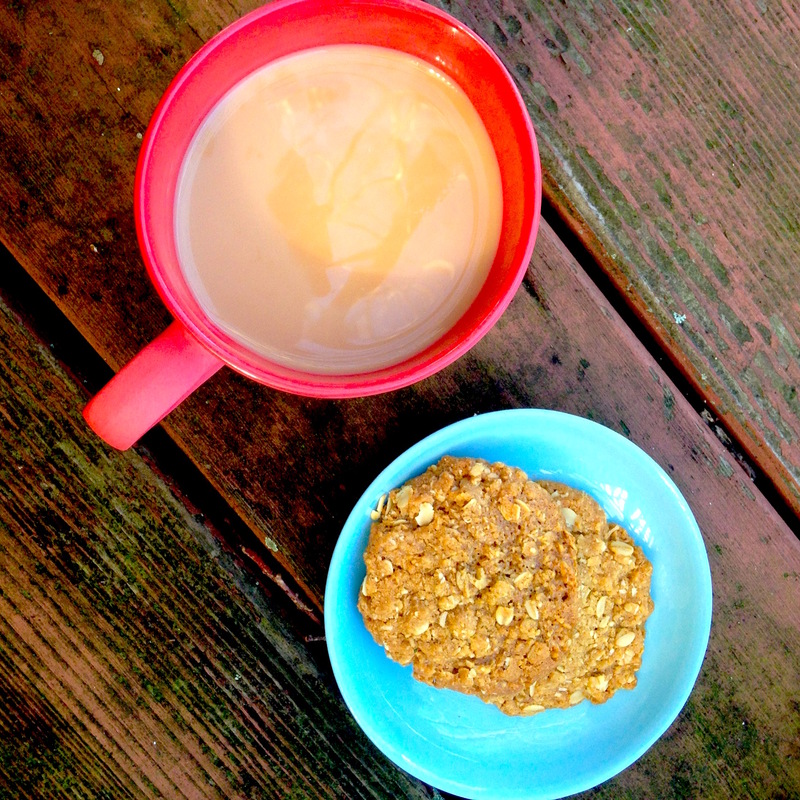 There are two distinct types of Anzac biscuits – chunky and chewy and thin and crispy. Both have passionate supporters and families can be split down the middle in their allegiances. This Anzac day after baking a batch of biscuits I had a sudden epiphany. 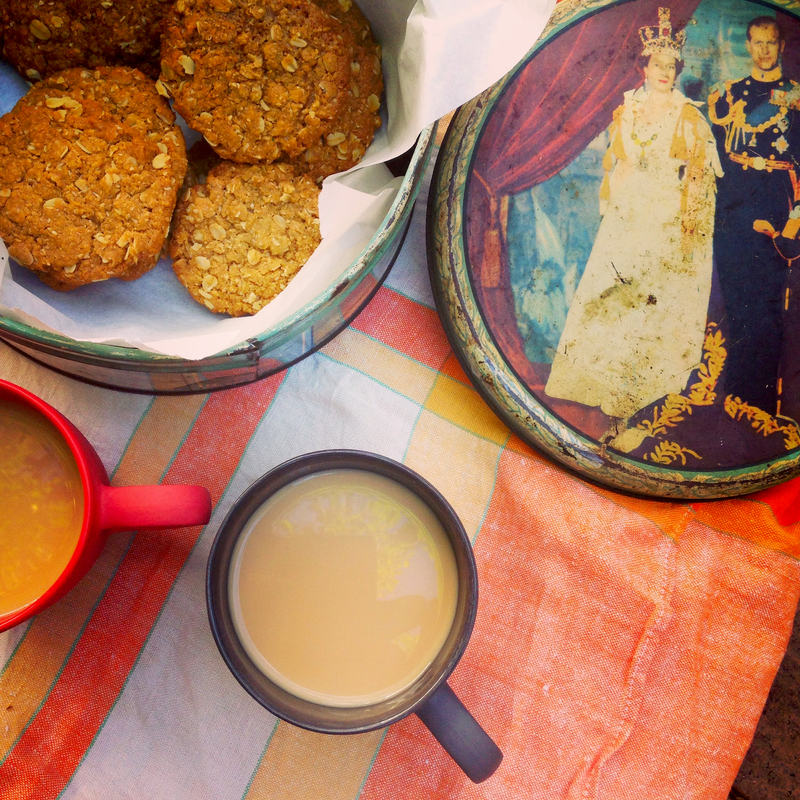 For years I’d been making chunky and chewy Anzac biscuits when my favourite Anzac biscuit was thin and crispy kind, the reason I’d never settled on a recipe was because the perfect Anzac had always eluded me. This set me off on an obsessive mission, I started baking Anzac biscuits every second weekend in search of the perfect thin and crispy biscuit. A lot of recipes promise a crispy, thin Anzac but they don’t deliver. There are a lot of theories about how to achieve a thin and crispy biscuit – use less coconut and less liquid, bake in a low oven, allow the dough to cool before baking – but they were all wrong. Finally I came across a recipe from the New Zealand food writer, Annabel Longbein. This recipe uses more sugar and golden syrup than most, which makes a wetter dough and they are also flattened out before baking. If you’ve been making do with chunky, chewy Anzacs, while secretly yearning for thin and crispy Anzacs, search no more. This recipe makes a thin, crispy and slightly caramelized bikkie. Make a double batch because these biscuits keep for weeks in a tin. You could probably send them to Europe on a slow boat and they’d still be good – just like the original Anzac. Mix together flour, coconut. oats, brown sugar. Mix melted butter and syrup with flour, oats, coconut and sugar until well combined. Roll into walnut sized balls. If you want biscuits that are chunky and chewier biscuits place in balls on baking sheets in balls and cook for about 30 minutes until golden brown. If you want thinner, crisper biscuits place balls of dough on sheets and flatten down, until thin. Bake for about 15 to 20 minutes until golden brown. Let cool on sheets for five minutes and remove to racks to let cool completely. Store in sealed tin. Biscuits keep well for at least two weeks. It’s great isn’t it. A friend gave it too me on a long loan when she went overseas and she’s never asked for it back. I don’t think the white sugar works as well. I tried one recipe with half brown and half white sugar and they were disappointingly chunky and chewy.